So the first thing we did was we climbed up the path and up ahead of the Archaeological Museum. And then when we went up and saw the whole Imperial Courtyard lined with army men!!!! In Turkey, every young man Has to join the army for atleast a year. The logic is that this will make the Men a Little (=Read LOTS) smarter and sensitive (=:P) and also develop patriotic feelings. As well as get everyone to compulsorily do community service. And just then we saw…!!!!??? What did we see?? That remains to be seen in another Story, Stay Tuned. The Topkapi Palace gate was large and imposing. I looked back on the crumbling palaces I’d seen in my travels and wished we would care about our history as much as we cared about money. India would have a lot more visitors then for we’ve got a cultural heritage worth the envy of any country. The gate led us to the main courtyard where we looked at the huge grounds split up into a star. We walked into a room which in Indian Palaces is commonly known as Diwan-E-Khaas (or the room where the Sultan held meetings with the priests and noblemen). In Turkey though it was called the Imperial Council. And as we entered..whoosh!! The ceiling stunned us. Such beautiful gilded paintings and maintained so well!! Plus there were spots demarcated as to where the Sultan sat and where the Council sat. We were 4 of us sharing one audio guide and so we had to pause for a while to catch on to all the information we were being told. The council hall has multiple entrances both from inside the palace and from the courtyard. The porch consists of multiple marble and porphyry pillars, with an ornate green and white-coloured wooden ceiling decorated with gold. The floor is covered in marble. The entrances into the hall from outside are in the rococo style, with gilded grills to admit natural light. 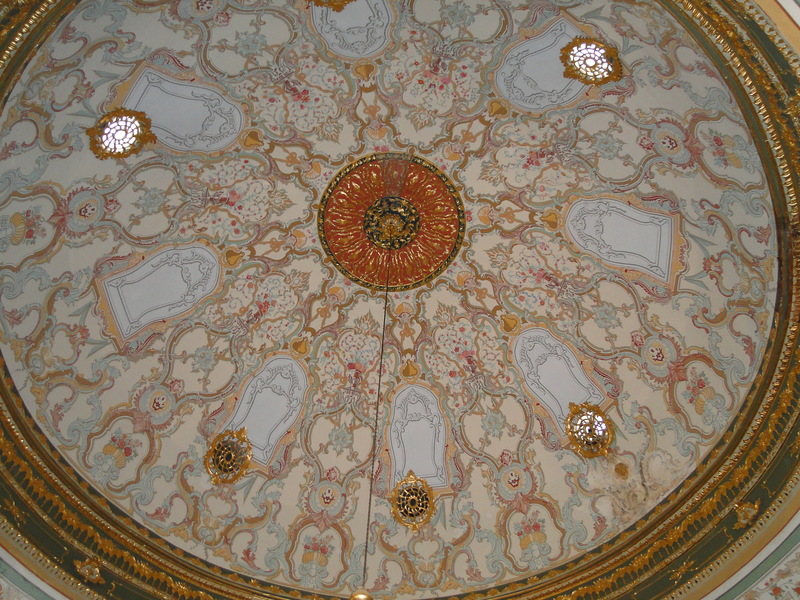 While the pillars are earlier Ottoman style, the wall paintings and decorations are from the later rococo period. Inside, the Imperial Council building consists of three adjoining main rooms. Two of the three domed chambers of this building open into the porch and the courtyard. We do not have many photos from what we saw in other parts of Topkapi. The reason being, we passed the Imperial Treasury, The Jewellery Room, The Ancient Relic Room. All these rooms had items precious to the National Heritage of Turkey which is why we were not allowed to click photographs. The Imperial Treasury contained relics from the Byzantine Age. Also there were articles of daily use by the Ottoman Sultans. The collection we see now consist of gifts of ambassadors, enthronement gifts, and purchases of the Sultans themselves. There were shields and armours encrusted with pearls and precious stones. There were fragrance holders and goblets made of gold with rubies and emeralds. Queens would be proud of their jewellery boxes so carefully preserved. 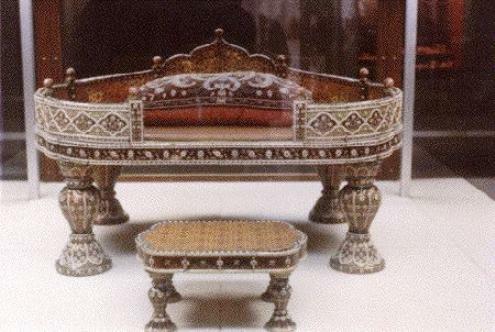 Even the Peacock Throne of Emperor Jehangir which was stolen by Nadir Shah and lost in time, was preserved. I don’t want to be biased to India but amongst the other jewels, our Indian throne shone through. The pearls were set so carefully and evenly. It was a delight to look at it. Of course i was happy it was preserved in Turkey and not in India. This website was one that gave excellent descriptions of the Treasury Room relics. There is a huge line getting into this exhibit. It is a hugely popular exhibit. At the entrance of the exhibit is the Ottoman Symbol for prosperity and money. I’ve yet got the Room of Ancient Relics and other points to do. But that remains yet another part of the journey!! 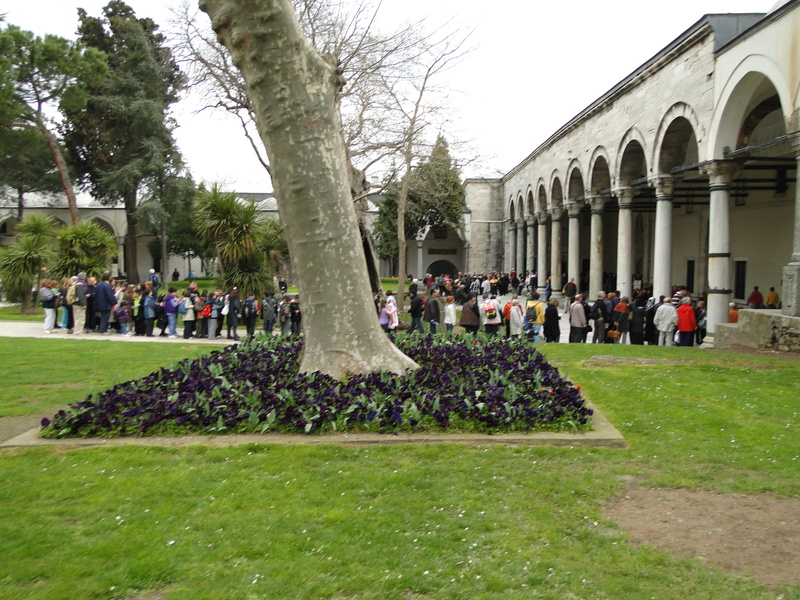 This was the day when we finally visited the Topkapı sarayı. This Palace is a spectacular example of the Ottoman exuberance as well as the passion the Turks have to conserve their wealth and monuments. 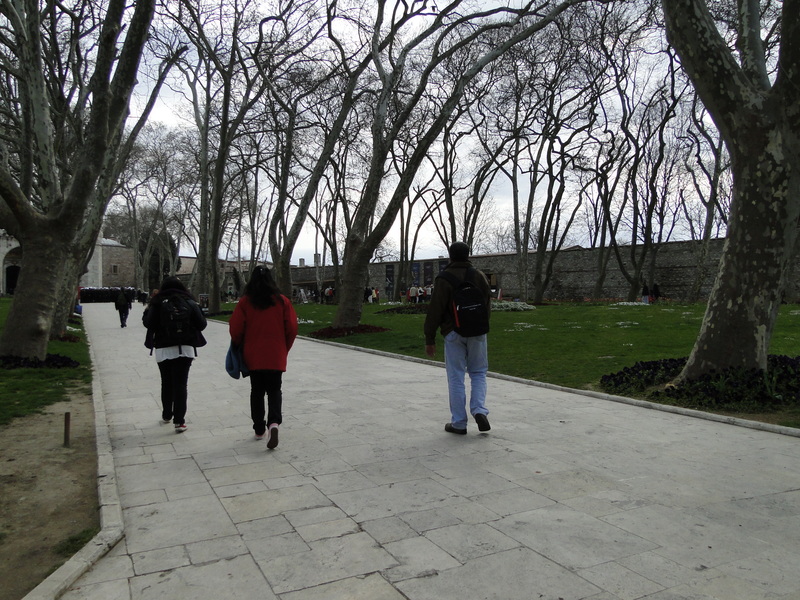 As soon as you enter the Topkapi, there are two paths, one which is called “Valentines Path” which is a path that leads a little into the grounds where couples can generally practice some PDA and an uphill road leading to the palace. A note about Istanbul: This is a city that has a lot of walking involved..lot of uphil walking and climbing. To check the museums and especially to feel that you got your money’s worth, you’ll no doubt check every tourist attraction thoroughly which means considerable walking. If there are any plans of visiting Istanbul soon then work on your fitness…you will need to!!!! Back to the Sarayi.. (=Palace in Turkish). We had to climb on a cobbled road that had some marble columns at the side on the grass. Cars could be driven inside though. On the way to the Palace, the Istanbul Architechtural Museum presents itself. Back to the point..what i was saying is this place merits a full day. They charge TL 35 to get in and it doesnt make any sense to rush it. There is So much to see!!! Now i know keeping up with the typical Indian Itenerary (=I know we tend to Run, Daud and Race…oops someone’s movie list spilled over!! I mean we Indians tend to run across a country in 2 days and be proud of that!!) , with a travel agent, this would be done in say 2 hours but believe me there is so much more to the Palace. Not only are you seeing an important part of Turkish history and tradition but also has a Stunning Treasure Room. Topkapi Palace was not only the residence of the Ottoman sultans, but also the administrative and educational center of the state. Initially constructed between 1460 and 1478 by Sultan Mehmed II, the conqueror of Constantinople, and expanded upon and altered many times throughout its long history, the palace served as the home of the Ottoman sultans and their court until the middle of the 19th century.The Holy Relics of the Prophet Muhammad, and the imperial archives continue to be preserved at Topkapi. Following the abolishment of the Ottoman monarchy in 1922, Topkapi Palace was converted into a museum on 3 April 1924, on the order of Mustafa Kemal Atatürk. But we didnt end up going to the Harem 😦 we indeed were running on a tight schedule. After Topkapi we had to go to the Bosphorus for our cruise which meant we were having a pick up from the Hotel. I suppose i ended the last note at the point when we just edged past the Galatasaray Lisesi. And after the yummy snack we picked up. The rest of the walk was filled with plenty of fun and lots of memorable photos. The walk ahead also had a lot of buildings with beautiful carvings and intelligent lighting. In the midst of a chaotic shopping boulevard there was a black gate and inside lay a pink building which exuded calm and serenity. That was Church of St Anthony of Padova. We didn’t know it back then but we do now thatit is the biggest Roman Catholic Church in Turkey. It seems this Church was built by Italian settlers in 1725 but later was demolished and then rebuilt at the same site. The building was designed by the Istanbulite Levantino Italian architect Giulio Mongeri, who also designed many other important buildings in Istanbul and Ankara; such as the Maçka Palas (which houses Armani Café and Gucci) in Nişantaşı and the Neo-Byzantine style Karaköy Palas bank building in Karaköy (Galata), Istanbul; as well as the first headquarters of Türkiye İş Bankası in Ankara. Alrite back to the Church. There were people lighting candles in little tranches on the side a la Mount Mary Church in Bandra. In all it was a very good feeling to go there. Oh i forgot to mention about the incident while we were snapping oops clicking pictures of the sign saying “Istanbul Shopping Festival”. Like the mad photo clickkers we are, we went on snapping and then suddenly this guy walks up to me and says “Thank You”… forget the fact that he was a decent looking Turkish dude but i had literal question marks floating over my head a la Archie Comics Style. Then was the prank stop . Ah this roadside stall was the best memory from the whole trip. There was this great stall which had stuff like Magic Ink, Fake band aids, swords you could push thru your head etc along with the standard supply of bugs, beetles (=More keedas for people who already have a lot of keedas :P). Thats how i get a photo of me with a nail through my finger and the funny disguise. Finally the perfect dinner opportunity presented itself in the form of BBQ Chicken. This is the place that looked really decent and I thought would have good food. Turned out the food was delicious (=For once i won’t comment on the food!!) Plus the waiter was helpful. WooHooo….hello, where’d the credit card go?? This is a view into why Istanbul merits more than a week in your travel agenda..I dont think i will detail about any of the monuments just list them. If you thought i’d only give you a list and run away, you were mistaken. I’ve got anecdotes as well. Ok so we were wandering through the lanes of Miniaturk lookign stupefied totally at everything we had to see. We stumbled upon Ottoman relics out of Turkey as well in places like Egypt and Damascus. The Ottoman styles of architechture is stunning with great attention to Minarets and arches with deocrative entrances. There was a bridge that connected one part of Miniaturk with the other which was the Bosphorus Bridge replication. Indeed so as the Bosphorus Bridge does the important part of connecting the European and the Asian side of Turkey. There is also a rail line where a railway is driven for kids a la the rail at the Santacruz Park (=:P There is a train there…lots of funn!!) WE posed ob!! There were a lot of monuements to see but the interest was dimming 😉 We marvelled at the beauty and the effort taken to make Miniaturk. We of course spent time taking a lot of TP pics like with me pushing the Galata Tower and holding a minaret etc etc. After a huge huge tour, we rested our feet and had a chocolate as we watched kids drive remote controlled boats nearby (=1 turlish lira s’il vous plait) I would have liked to do that!!!! After this we made our way to the Victory Museum which was an ode to Ataturk. But that as we say.. is another story..
Alright so we are back to Miniaturk, the park where every Turkish Monument is replicated for everyone to see. Q: How will you know which monument is in front of you and what it represents? A: (Ref Photo 9) The black box in the photo depicts an info box. On the Miniaturk ticket there is a bar code. A red beam catches the code and there is an audio that tells the person about the monument. This infomedia is available in English, Turkish, German and i guess a host of other languages. Anatolia also Asia Minor, is a geographic and historical term denoting the westernmost protrusion of Asia, comprising the majority of the Republic of Turkey. The region is bounded by the Black Sea to the north, Georgia to the northeast, the Armenian Highland to the east, Mesopotamia to the southeast, the Mediterranean Sea to the south and the Aegean Sea to the west. Anatolia has been home to many civilizations throughout history, such as the Hittites, Phrygians, Lydians, Persians, Greeks, Assyrians, Armenians, Romans, Georgians, Anatolian Seljuks and Ottomans. As a result, Anatolia has been of interest to archaeologists. These houses on the banks of Yeşilırmak River in Amasya were built at the end of the 19th century and the beginning of the 20th century. One of their most noteworthy features is that they were the first prefabricated houses in Anatolia. Indeed, some of them were put up within as little as one day. These houses in Amasya are fine examples of Anatolian Turkish civilian architecture. Remains of the Commagene Kingdom are to found at an altitude of 2206 meters on Mount Nemrut near the town of Kahta in Adıyaman. Dating back to 80 B.C. – 72 A.D., these ruins are referred to as the 8th wonder of the world. On the eastern side of the open-air temple on Mount Nemrut are eight scuptured statues of gods, measuring in length from 8-10 meters, placed on wooden pedestals. These ancient remains were rediscovered by a German engineer in 1881. The site which was restored in 1984 was declared a National Heritage. Again supreme attention to the detail. wonderfully done. There are an incredibly large number of monuments, mosques and artefacts in the Anatolian region and places like Ankara (=BTW the capital of Turkey!! ), Izmir, Bursa, Edirne etc. meaning “cotton castle” in Turkish, is a natural site in Denizli Province in southwestern Turkey. The city contains hot springs and travertines, terraces of carbonate minerals left by the flowing water. We were stunned at this display. The amount of editing i’ve had to do is a testimony to Turkey’s rich heritage and the efforts put into this display..!!!! MUST SEE!!! The next section deals with Greek Monuments scattered around Turkey which have fallen into ruins but have been reconstructed for everyone to see. Move Over Beckenscot…Miniatürk is Here..and How!! This place happens to be a little into the Istanbul suburbs (=On the European side of Turkey though) so we had to cab it. We had the reception ask for a cab and drove off along with our armour of woolens and jackets. The Cab driver was a quiet sullen one actually, (=We’re really used to cheery cab guys and pick up persons because we chat a lot with them) and it seemed as he resented driving us till there. Driving through the Istanbul suburbs didn’t present a postcard version of the city. Of course the landscapes and the water along the road made it scenic but the houses were tumbledown and looked a little old. Houses here are like the ones in the photo..but these houses were a little old, wore signs of occupation for years and had clothes hanging outside..also it was a little congested with a lot of houses packed together. 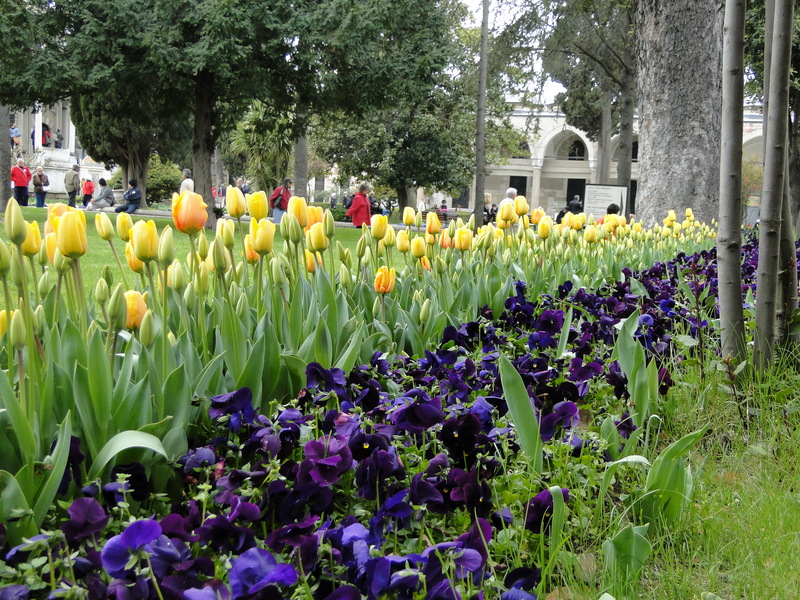 But I don’t mean congestion in the Indian way keeping Mumbai in mind…there were adequate open spaces and trees with beautiful tulips planted. It was a sight to watch but not as beautiful as the buildings are in the Historical Peninsula, the place where we were staying. Miniatürk covers a total area of 60,000 square meters. Its model area is 15,000 sqm, making Miniaturk the world’s largest miniature park in respect to its model area. Miniaturk also boasts 40,000 sqm of open space, 3,500 sqm of covered area, 2,000 sqm of pools and waterways, and a parking lot with a capacity of 500 vehicles. Miniaturk is a vast expanse of land which has been very well planned. Also it shows a glimpse of Turkey (=Rightlu summed up as Turkey on My Plate), you do get a rush tour of Turkey as a country and its shift through the times. This is an excellent place to bring children and make them proud of their heritage. Like I said, it’s a MASTERPIECE. This keeps monuments and history alive even though the actual may not be in a good condition. And there are no two ways about it, this is a place that has GOT TO BE VISITED. So we got in after taking an entry pass, and saw about 2-3 groups of school students being led by their teachers to this park. I’m sure if i was someone who went to a school in Istanbul, I’d insist on being taken here. I’m going to elaborate about these 3 sections separately so that I do it justice. But what we did find here is the committed efforts of the Management to make sure that these Representatives are kept in proper condition and are regularly cleaned. Also that repairs are made as and when necessary in phases so that one section of the park is always being maintained. (=A pretty good way of making sure the entire park is functional). There were people scrubbing these Reps with water and a brush. There was even a provision for drainage of water that’s on top of the monument so that water does not accumulate. You just have to appreciate the amount of effort that has been put into making these Representative Models and in taking care of them. There is also a restaurant on the premises that serves good food (=Unlimited bread here as well!!) We did take a lunch break half way into the Anatolian region and ordered some Pizza, Soup, Pasta and a Curry. One was a Meal Special. And they don’t make their pasta from scratch its a thawed one on your plate for all the anti-frozen brigade. But the food is good and reasonable. Along with Miniatürk, there is also a Victory Muzesii & Crystal Muzesii (=Muzessi-Museum). The Victory Museum is dedicated to the Turkish war of Independence. During the First World War, Turkey fought with Germany and also overthrew the Caliphate to be established as a Republic on October 29th, 1923 led by Mustafa Kemal Pasha Atatürk. The Crystal Museum is a place where a few famous landmarks of Turkey are showcased in crystal using light and special display. So as you can see, Miniatürk is a fascinating place to visit if you’re cut short of time. But DO spend your time slowly savouring the Representatives and appreciating the history. Also the Representatives are very realistically done with beautiful carvings replicated. Take your time with your camera and have a snack to keep your power going. Author NMPosted on September 10, 2012 Categories Turkey 2011Tags Conserve, Explore, Fun, History, Istanbul, Miniaturk, Turkey, Writing13 Comments on Move Over Beckenscot…Miniatürk is Here..and How!! Istanbul has a way of charming even the deepest cynic. It is a city that mixes Tradition with Modernism and while the life is pretty fast paced, it is gentle enough to offer you a pillow of support and welcoming arms. Watching the sun fade into the distant horizon, you could almost imperceptibly note that life had paused, that you could catch your breath and that some good rest was on your way. You will never be friendless in Istanbul. The people here, perhaps nurtured by the subtle interactions with life and its pace, will always lend you a patient ear..It is this charm that makes Istanbul and Turkey a destination that MUST be visited. There was a restaurant that was playing peppy rock music.. (=Turkish Music is Happening…Turkish Artists have very good songs) but i don’t know we didn’t stop there, we walked ahead up to a place called ‘GalataKupa Diner’ and had the owner come out and give us a sales talk on his restaurant and we decided to go there. All in all we had a nice time. The waiter who took our order was joshing that i was the”Boss” because i was the one keeping tabs on the money. When we came to face the Bosphorus, we could see the Bosphorus Bridge (=One of the longest suspension bridges in the world) It was lit up along the suspensions and the light kept changing in colour. Also there were people setting up a ‘Night Market’ of sorts. There were coats, books, toys and some other things. But i have got to say you won’t belive how sunsaan this place can get late nights. So we got on quickly towards our hotel. We stopped at a local convenience store and bought water, ayran and munchies for the next day, passed through the Ozler lane, met George Clooney and then finally back to 202 and 203. After a long walk exploring the Galata Bridge, we made our way to the Galata Tower. The present day Tower is one that has been restored after fires burned down the Tower. I must add a word or two about their restoration, its usually done so well that you can’t make out that it has been done recently. Also there are efforts taken to keep up the restoration which means that the Monument is always looked after. Galata Tower was made by Byzantium Emperor Anastasius in 507 out of wood and called Watch Tower. In 1348 Geneose took over the tower and built it out of pile stone and called it Christ Tower. When Fatih Sultan Mehmet conquered Istanbul in 1453, the Tower got under Ottoman Management. Damaged in the fire of Galata in 1832, Galata Tower was restored by Sultan Mahmut the Second and used as a Sign Tower. Also restored in 1967, Galata Tower gained its present day appearance and is still used for tourist information. The Tower got its name from the historical province of Istanbul, Galata. This is a popular place for tourists as the Tower offers a panoramic view of Istanbul. It is a mode to see the Historical Peninsula. Also it offers you a beautiful view of the Bosphorus, Sea of Marmara and the Golden Horn. The Bosphorus Bridge looks elegant in the horizon. The Tower was packed to capacity..I mean the viewing portion was packed. And i don’t doubt why..the sunset is so beautiful, it paints the city in such vivid colours. The blue turns to orange and envelops you along with with the mosques across the Sea of Marmara. Also it puts the city across as being a vulnerable and tired soul who’s just about finished the day’s work..From the Tower, its a beautiful sight. And it is a very popular Tourist Attraction. Taking a full round of the Tower gives you a total panoramic view of both the Historical Peninsula and the Suburbs. Also you can see the Bosphorus Bridge and the Asian side of Istanbul. Like the photos below show…this is a sight that everyone wants to see. Which is why it was a very crowded audience on the top. Also if you are going there, do take your arsenal of warm clothes becuase it will be windy. (=Do Not follow this if you’re going in the Summer-its a given). It is indeed a restful sight to see the sunset. There was a point where we were stuck because too many people were moving back and forth but that can be forgiven. By the time we made our way down to the square, the lights had started twinkling and the Tower and Istanbul looked like a mysterious figure in silhoute. Yellow lights softly illuminated streets, corners and monuments. And we took it all in as we made our way to dinner. Istanbul is also famous for its trams. The main road which bordered the Topkapi Palace had a tram line. Every 5 minutes a tram would pass to or fro. To go to the Galata Bridge, we had to pass through a side lane (=Remember the lane we had to go thru to reach Ozler??) So one of those lanes got us to the main road. A little further on the main road brought us to the Istanbul Gare. Its a beautiful building designed by Mustafa Hamdi Pasha. The “Orient Express” made famous by Agatha Christie’s namesake thriller, terminates here. The road opens up to the Bosphorus. The Bosphorus is a strait that separates the European and Asian side of Turkey.It is the world’s most narrow strait and is also the most navigated (=Istanbul’s waters are pretty busy you know). It connects the Black Sea with the Sea of Marmara. Most of Turkey happens to be located in Asia but the Turks prefer not to be associated with the “poorer” continent. Whereas Europe constantly snubs its “poorer” fan. Yea so back to the Bosphorus. Since there is a lot of activity on the European side, there is a constant exchange of traffic both people and cars (Photo1). It was fun to see a boat bring in cars from the Asian side. Since this opened to the sea, it was quite windy. There were carts at a small distance of each other selling Kestane, Corn, Samit (=Bread with sesame). There were also stalls selling coffee(=Kahve to you), fish sandwiches in which the fish was grilled with mustard oil it smelt but i really can’t be sure. Anyway it didnt look very tasty so we skipped that. 2. It connects the Historical Peninsula with the ‘Suburbs’ and Work Places at Istanbul. Also we had to constantly duck because of the whiffs of cigarette smoke (=They all Smoke!!). Also If your ‘Road Crossing’ Instincts come alive and you want to explore the other side of the bridge then I’d advise you not to put a foot out of the pavement because you would certainly be run over by a car or a tram. There is a subway which can be used to cross. It seems that the bridge was built 5 times and at one point during the reign of Emperor Justinian toll was also collected from the people. It is one of the few bridges in the world to carry electrified rail tracks. All daily city tours in Istanbul include this bridge as it is the passageway to the Old City of Constantinople. I Spy…: When we started walking across the bridge, we noticed a peculiar sight. There seemed to be a lot of people fishing. (Photo 7) Literally fishing, baiting with some small fry or worms, they reeled in their lines waiting for the fish to be caught. Some of them had freezers and other manual equipment that could guarantee you a solid entertainment. Also you’ve got to carry a sweater or a muffler of sorts because it gets very windy and chilly as the evening progresses. So we walked ahead joking about everything under the sun, looking at the people who were fishing. When we crossed the bridge, we saw this vendor selling “Churos”. Now when we’d visited California back in 2001 Churos were fried bread dipped lavishly in cinnamon sugar (=Yummm). So we got some of that labouring under the impression that it was the same thing. But, it turned out to be fried bread in sugar syrup making it like a crispy ‘Gulab Jamun’ (=:P). It was enjoyable nonetheless. Now to find our way to the Galata Tower, we’d have to cross the road which was no mean job let me tell you. But luckily for us there were people who crossed like how everyone crosses back home (=Phew, lucky break) so we did manage to get across. After that, a few directions and an uphill road were the only things that kept us from reaching there. There are many lanes and by-lanes that oft lead to the same place so you can be sure that the route you took would lead you somewhere close to where you want to be. The road that we took to go to Galata Tower was an uphill one with a lot of climbing en route. There were a series of steps first and then a curved road lined with some apartments and Couture Clothes Shops. We were quite out of breath when we finally reached the Tower. It seems the Tower at one point was crumbling but speedy restoration led to the Tower being in its present state. When we reached the square, we had a seat on a bench and munched on some chocolates (=Power Boosters!!) while we watched some dogs play.